The Gentleman Crafter: Getting Ready! Just wanted to pop in and say hello and goodbye! LOL! I'm off to Grapevine, Texas in the morning for the Scrapbook Expo. Hate to sound like a broken record... if you are around Grapevine and the Dallas/Ft. Worth area...I would love for you to come by the Crafty Scrappers booth and give Carolyn, Gena, Anita and myself some love! I'd love to see ya! It's going to be so much fun! I will primarily demo on Friday...Tim Holtz New Awesome Distress Paints and Dyan's lovely new sprays and stamps. Saturday, I'm going to try and get away and shop! LOL! Poor AMEX Card! Tonight, I have been running around in my usual mad dash trying to get things done! Do I have this ...do I have that...why am I taking a hair dryer for gawd's sakes...toss that back and grab 3 more pair of underwear.... for an overnight stay!..why? I have no idea! Just the way my mind works I guess! Still trying to figure out why I have 6 watches in a Ziploc bag! Good Lawd Gertrude! Who cares! Anyway, I have painted, errr...stained rather, my best shirts because when I was packing. I had no idea that my hands were all inky with Dy's Dylusions and Tim's new Distress Paint! BLAST! OH well! Art shirts I say! Art shirts! I AM THE PAINT AND INK! YES! I'm trying to make this blog post interesting with some pictures! Ready to be shocked? Guess who this is....I found this picture on my computer at work! Again...why? I have no idea! LOL! Ready???? Are you sure??? LOL! Well, off to see if I really need to take all 6 watches...Hope to see you in Grapevine, Texas... if you can make it..If not I will take some pics! I think I bought that same shirt for my oldest son - in college at the time. LOL. You two were absolutely the cutest! Lucky people who stop for a demo tomorrow! Have a blast! lol Jim, be at one with the ink! You're wearing the same shoes! Cute! Love all the pastel colors in the crafty mess above! Have fun - give yourself a hug from me - I would give you a big one if I were there! HaHa I noticed they were wearing the same shoes too ... maybe same belt too! I love the picture Jim, don't you just love looking back on the good ole days? It sounds like you pack like I do, I always wait till the last minute. Have a great time at the Expo, have Cesar video it for us if he could. I can't wait to see the finished projects, you will show us won't you? Have fun! Have fun at the show Jim! Thanks for sharing the photo, but I have to say I think you look way more handsome now!! What fun!!! Thank you so much for sharing your picture!! Have a ball at the EXPO!!! I wish I were coming....I NEED Tim's new Distress Paints. Be sure to take some pictures to share. Safe Travels!! You guys look cute. And still cute today. I think Cesar is awesome even though we only met that one time. And you, that goes without saying. Enough ego stroking! Have a terrific show. Wish I could go but have other things going on. I am anxious to get my hands on some of Dyans fishy stamps! Have a safe trip. Hi there! This is my first visit to your blog, and I had to tell you that you gave me a little chuckle tonight. And your work table looks a lot like mine! :) Thanks for sharing and have a good time at the Expo! LOL the picture! I had BIG hair in the 90's too! Cannot wait to see you guys tomorrow, so excited to have you helping us and sharing your creativity. I had the old ink transfer trick last week-end...mine was color wash...wishing it was Dylusions and distress paint...waiting for those to hit our shores! Hey you guys are still handsome. Just a little vintage like fine wine. Have fun . Have a blast. SOunds like you had one today with your packing. Handsome guys you were and are. LOL!!!! You always make me laugh...I love your southern expressions and don't even get me started on the pants...LOL!!! Anyway, I wish I lived in Texas cuz I would definitely be there. Have fun, of course you will have fun, your Jim! Have a great weekend! Oooooo loving the colors on that work table! I spy some of those Dylusions sea creatures. Omg, what a blast from the past. Fun! Handsome guys then and now. Have a blast this weekend. great "vintage" photo!!!!!!!!!!! y'all look good! love your painty shirt....ummmmm....i don''t own a t-shirt that doesn't have paint on it....and only a couple pairs of jeans that aren't painty....it's a fashion statement!!!!!!!!!!!!!!!! Nothing like a good old photo to get you laughing! You two were cute then and still are. Wish I could come to TX, and play. Sounds so fun. Maybe chat on Sunday. yes, nothing like time and gravity to change you...lol thanks for sharing! wish I was there ~have fun! I thought I recognised Bath from the photo! You both look really sweet (as you are now of course). Enjoy your demos and the shopping! (Photos or a video of your new stash when you get back please). Jim your the greatest, it's wonderful how full of life you are and how you always find a way to make your followers Laugh. Love those colors on your work table. Have a wonderful weekend. I remember buying those shirts for my son. You are too cute, both then and now. I so enjoy reading your blog! 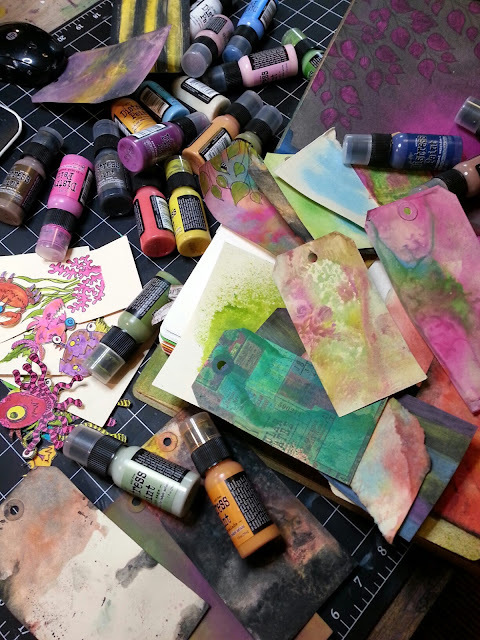 I love that inky tag mess on your desk--sure hope you will demo your creations using the Tim and Dyan stuff on an upcoming ustream show soon--please please hint hint. Have a great time in Grapevine. If I were anywhere close, I'd stop in and say Hi! Love the pics! Of Course you need 6 watches!!! and you need extra underware.... you never know what's going to happen in the Big City!!!! Thanks for sharing the pic, you guys look almost as good back then as you look now!!!! Oh my, what handsome boys you both were...and still are! You are a delight to me, and although I don't always leave a comment (sometimes too much arthritis to type), I appreciate you so much. Awesome pic..Still dapper and handsome today! My friend from hs has a daughter who found pics of me and her mom from 1984 and posted them on facebook. Oh my, what a surprise... I nearly fell off my chair. So funny. Have a safe trip and I look forward to seeing what you show! Two very goodlooking guys. Today just proves how some things just keep getting better as time goes by. Loved your colorful work top. Have fun today! Wolf whistle at both the picture and lovelies on the craft table! Safe journey and sane spending this weekend! Ditto, ditto, ditto on what everyone else has said. I saw that you two had the same shoes before I recognized you in the photo, Jim! ;-) And, yes, I too had a shirt just like that. In fact, I still have it and it is one of my "winter" paint shirts. Do I get fashion points for having seasonal paint shirts? I hope so, because I don't get many fashion points otherwise. I'm a watch, bracelet and earring person, so I'd be most likely to pack 6 of each for an overnight trip, too. Enjoy yourselves. We're all looking forward to reports and pictures. 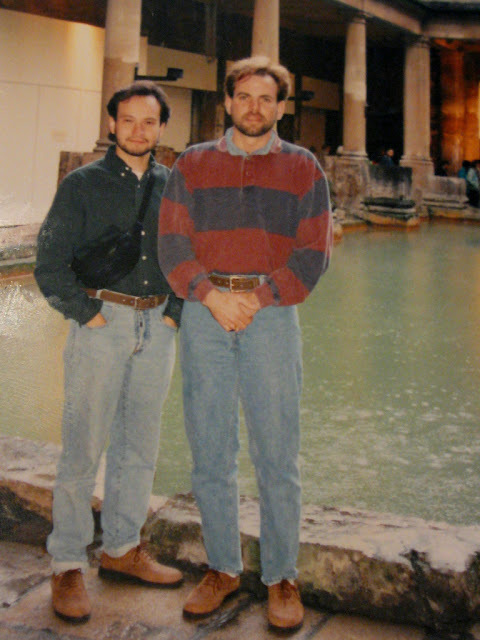 My sister and I had our pictures taken at about that same spot in Bath. I'll have to see if I can find them and see how much we've changed. I'm sure it will be a good laugh. Handsome fellas...today and yesteryear! Hope you had an awesome day demoing! Wish I could have have been there too! Safe trip home! The "MC DREAMY" TWINS...both handsome men...I'm sure I too could dig up a photo or two wearing "mom jeans"
Ahhhh memories and old photographs are wonderful for the heart and soul. Thanks for sharing. OMG! I LOVE the picture of you and Cesar! What a wonderful treasure...yes, both of you are truly treasures!! !